Beyoncé has launched Shimmering Heat, a new fragrance for women. Shimmering Heat is a flanker to 2010′s Beyoncé Heat. A euphoric blend of addictive Pink Pepper, fresh Wet Greens, and dewy Freesia Petals is followed by an intoxicating bouquet of Jasmin Infusion, Rose, and Muguet. The rare Blue Mystique Orchid electrifies the exotic bouquet heart and adds a radiant elegance. Smooth and sensual, the base of Oakmoss, Patchouli, Musk and Vanilla Infusion embraces the mixture with a natural and rich texture. 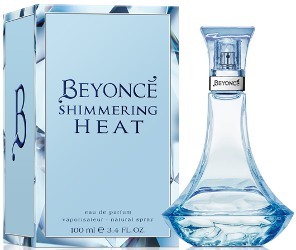 Beyoncé Shimmering Heat is available in 15, 30, 50 and 100 ml Eau de Parfum. I understand they’re trying to tie it to the Blue Mystique orchid, but the bottle is an odd color for something called Shimmering Heat. It looks icy-cold to me. My ears perked up at the oakmoss. I”ll try this if I ever see it. True, it’s the color of sport fragrance. Wow. That is some truly awful packaging – box and bottle both. It’s like the perfume equivalent of a D-movie, created with no aspirations to ever play in a theater.